The pistachio tiramisu is a tasty variation of the classic coffee tiramisu. For its particular sweet and sour taste, pistachio is widely used in the kitchen both in sweet and salty preparations and in this preparation we find it in cream form together with the classic mascarpone cheese. If you want to make a good impression at a dinner or prepare a delicious and irresistible snack you just have to try this recipe! At this point you can compose your tiramisu: dunk the ladyfingers biscuits in the coffee and form a first layer at the base of the pan (7), continue alternating layers of cream with pistachio and lapdyfingers biscuits (8). 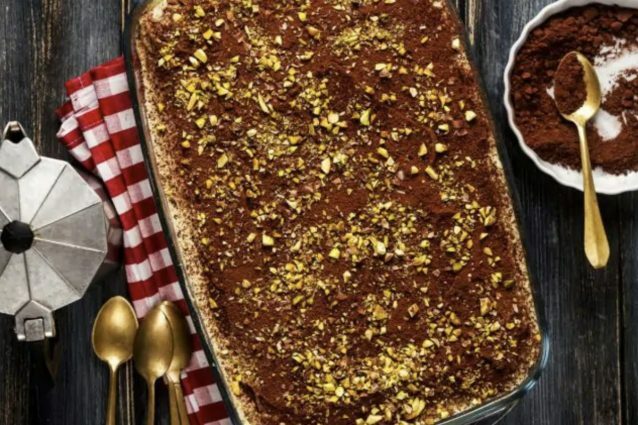 Cover the top with a generous sprinkling of bitter cocoa powder and a handful of chopped pistachios (9). Before serving, leave your tiramisu in the refrigerator for about two hours. If, in addition to taste, you also care about aesthetics and want to present a dessert good to eat and nice to see, make your tiramisu in a wide-bottomed glass: in this case the advice is to break the ladyfingers biscuits in half and continue in the stratification alternating with the cream of pistachios using a sac-a-poche to distribute it evenly. If you do not have electric whisks at home, do not worry: you can use hand whisks, it will take a little more effort but your cream will be equally good and creamy. 3 Pistachio Recipes for Every Occasion!